14 • June 2018 • S I G N & D I G I T A L G R A P H I C S Ricoh Adds EFI Printer to its Portfolio Tokyo-based Ricoh, a manufacturer of commercial inkjet printheads, large format printers and office imaging equipment, announces the addition of the EFI Pro 24f LED flatbed printer to its portfolio, which already includes both the EFI H1625 and the high-speed EFI Pro 16h hybrid printers. According to Ricoh, the EFI Pro 24f offers its customers an excellent option for jobs that require fine detail and speed. 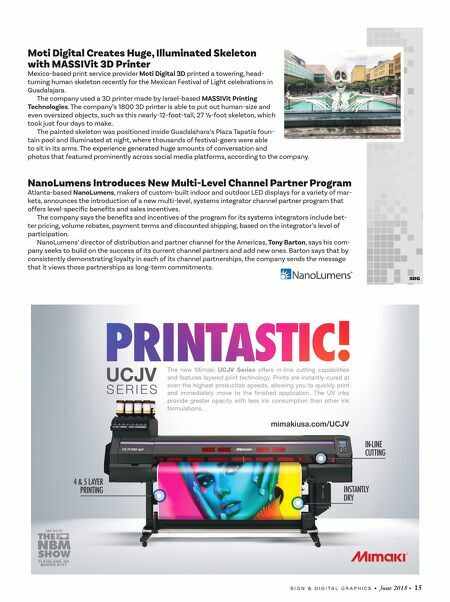 The company says the EFI Pro 24f makes printing high-value applications, such as len- ticulars, photographic backlit displays and irregularly shaped or heavy objects, achievable at a lower cost. The printer boasts speeds up to 1,157 sq. ft./hr, 1200 x 1200 dpi image quality and low curing temperatures that enable substrate diversity. MindFire Partners with Canon Solutions America Irvine, California-based MindFire Inc., a developer of marketing automation software that it sells into, among other places, the graphic arts industry, announces that it has entered into a reseller agreement with Melville, New York-based Canon Solutions America, a wholly owned subsidiary and the sales arm of Tokyo-based Canon Global. Under the terms of the agreement, Canon Solutions America will offer MindFire's cloud-based market- ing platform, MindFire Studio, to its customers. 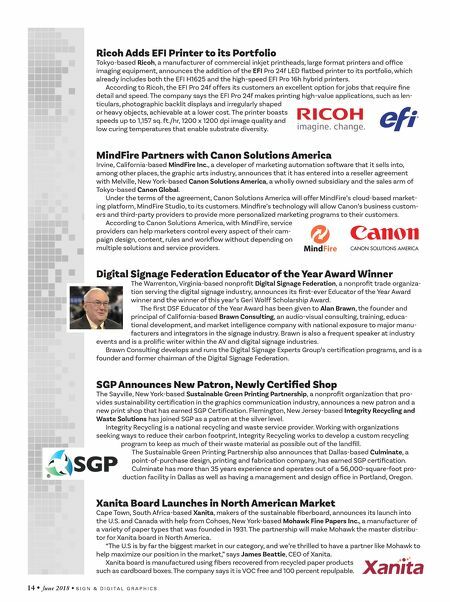 Mindfire's technology will allow Canon's business custom- ers and third-party providers to provide more personalized marketing programs to their customers. According to Canon Solutions America, with MindFire, service providers can help marketers control every aspect of their cam- paign design, content, rules and workflow without depending on multiple solutions and service providers. Digital Signage Federation Educator of the Year Award Winner The Warrenton, Virginia-based nonprofit Digital Signage Federation, a nonprofit trade organiza- tion serving the digital signage industry, announces its first-ever Educator of the Year Award winner and the winner of this year's Geri Wolff Scholarship Award. The first DSF Educator of the Year Award has been given to Alan Brawn, the founder and principal of California-based Brawn Consulting, an audio-visual consulting, training, educa- tional development, and market intelligence company with national exposure to major manu- facturers and integrators in the signage industry. Brawn is also a frequent speaker at industry events and is a prolific writer within the AV and digital signage industries. Brawn Consulting develops and runs the Digital Signage Experts Group's certification programs, and is a founder and former chairman of the Digital Signage Federation. SGP Announces New Patron, Newly Certified Shop The Sayville, New York-based Sustainable Green Printing Partnership, a nonprofit organization that pro- vides sustainability certification in the graphics communication industry, announces a new patron and a new print shop that has earned SGP Certification. Flemington, New Jersey-based Integrity Recycling and Waste Solutions has joined SGP as a patron at the silver level. Integrity Recycling is a national recycling and waste service provider. Working with organizations seeking ways to reduce their carbon footprint, Integrity Recycling works to develop a custom recycling program to keep as much of their waste material as possible out of the landfill. The Sustainable Green Printing Partnership also announces that Dallas-based Culminate, a point-of-purchase design, printing and fabrication company, has earned SGP certification. Culminate has more than 35 years experience and operates out of a 56,000-square-foot pro- duction facility in Dallas as well as having a management and design office in Portland, Oregon. Xanita Board Launches in North American Market Cape Town, South Africa-based Xanita, makers of the sustainable fiberboard, announces its launch into the U.S. and Canada with help from Cohoes, New York-based Mohawk Fine Papers Inc., a manufacturer of a variety of paper types that was founded in 1931. The partnership will make Mohawk the master distribu- tor for Xanita board in North America. "The U.S is by far the biggest market in our category, and we're thrilled to have a partner like Mohawk to help maximize our position in the market," says James Beattie, CEO of Xanita. Xanita board is manufactured using fibers recovered from recycled paper products such as cardboard boxes. The company says it is VOC free and 100 percent repulpable.